Breaking her silence for the first time on her husband, Priyanka came to his defence claiming the opposition attack was political and that she and the party would fight back such visciousness. 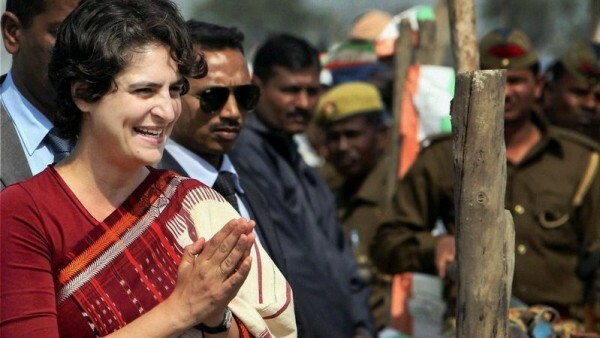 Priyanka Gandhi Vadra, daughter of Congress president Sonia Gandhi, on Tuesday said the allegations about her husband Robert Vadra were part of a concerted political attack on her family. Speaking at an election rally in Rae Bareli where she is campaigning for her mother, Priyanka said she was hurt by such allegations and “feel strongly against such vicious attack”. “Chunav ka samay hai, tamasha shuru ho gaya hai…(It is election time and people are saying so many things),” she said at the start of her address. She said she was saddened by the way politics was being done in the country. “India is a liberal nation. I am deeply saddened by the way harsh language is used to attack the political leaders during the political campaigns,” she said. “I have learned from Indira Gandhi that strong determination acts as a shield. The Congress party will fight back with determination,” she added. She said she found great strength in the words of her grandmother and late prime minister Indira Gandhi who always felt that truth was undefeatable and only emerged stronger by every attack. She said the language and allegations being hurled at her family and husband had hurt her immensely, and added how she tells her children that truth will emerge one day. Asking people to vote for the welfare of the country and future of their children, Priyanka said the future of the country lay in secularism and communal harmony as espoused by icons like Mahatma Gandhi. “I feel uncomfortable seeking votes for my mother because you all have given her so much, have embraced her though she was not born in India,” she said, and added that the idea of such an India which accepts every religion, caste and creed is something which she finds close to her heart while campaigning in the Lok Sabha elections. She, however, said that Sonia Gandhi had brought about lot of development in the constituency. ”Electrification in villages, laying of roads, opening of industry…lots has been done here,” she said. She also accused the opposition of deviating from the real agenda of development and instead getting busy with hurling abuses and criticism on opponents. Priyanka also urged the voters to vote for development, progress and unity of the nation. “It is because of Sonia Gandhi ji, that this place has seen so much of development. It is because of her there is electricity, water, roads, and several other facilities in Rae Bareli. I request you to vote for development, progress and unity of the nation,” Priyanka said.